We are delighted that you are interested in our church and invite you to join in our spiritual journey. As a congregation, we challenge ourselves to create a hospitable place in which we may all listen to each other, learn from each other, and share in the councils and leadership of this church. Membership is open to individuals and families who want a church home that values diversity in people and beliefs, and does not require adherence to a creed. The Peterborough Unitarian Universalist Church in Peterborough, NH is a gathering place for a freethinking religious community. Our faith is a spiritually alive and justice-centered religion that provides an open-hearted and open-minded path in the search for truth. We strive to nurture a loving, inclusive spiritual community where all ages celebrate together. As expressed in our mission, we witness for our liberal Unitarian Universalist faith with compassion and generosity, and we serve and inspire the local and global community through social action and the arts. Our church is a place where individuals are free to explore life’s ultimate questions in a community of other seekers and are encouraged to find their own answers. We come from many religious backgrounds. Among them are Christianity, Judaism, Humanism, Buddhism, Islam, Hinduism, and Earth-Centered religions. We also count Agnostics, Taoists, Pagans, and Atheists among our membership as well as individuals from many other faith traditions, and those who are unaffiliated. What we hold in common is acceptance of the seven Unitarian-Universalist principles. Has yours been left out of the above list? Then come and share it with us. Come and explore your individual path while sharing the journey of others. Experience our loving and supportive community and liberal spirit at your own pace and on your own terms. We are a place of freedom of faith. We are a place of excitement with a social conscience. We are a welcoming community of inquiring free thinkers. We invite individuals of all stripes, shapes, colors, ages, and sexual orientation to come and discover how we are bound together by shared values, social concerns, common interests, and fellowship. Our children receive liberal religious education as we model values in our search for truth and meaning. Come and find out if you’d like to join your family to ours. Our handicapped-accessible church is located on Main Street in downtown Peterborough, NH. Sunday services begin at 10:15 am September through June. Church school and nursery care are also offered at that time. 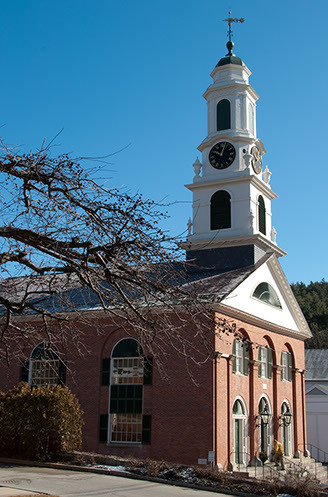 During the summer, while our regular services are on hiatus, the Monadnock Summer Lyceum offers renown speakers on various topics, ranging through social policy, science, economics, history, and the arts, in our sanctuary at 11 am on most Sundays. We're a BYOG church: Bring Your Own God.